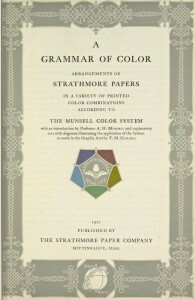 A Grammar of Color was published in 1921 by the Strathmore Paper Company and was intended to explain the Albert H. Munsell color system and then show how it can be applied. The book was 27 pages long, with illustrated text explaining the color dynamics by principle and applications, as well as two plates engraved by Rudolph Ruzicka showing balanced and unbalanced color and 19 folding sample color sheets of Strathmore papers that demonstrate various color combinations. Long out of print, it has become a collector’s item. Now the content is available for you to view through a series of posts in the Munsell Color Blog. The book contains an introduction from Albert Henry Munsell (posthumously), followed by explanatory text and diagrams illustrating the application of the color system by Thomas Maitland Cleland, entitled “A Practical Description of the Munsell Color System with Suggestions for Its Use”. 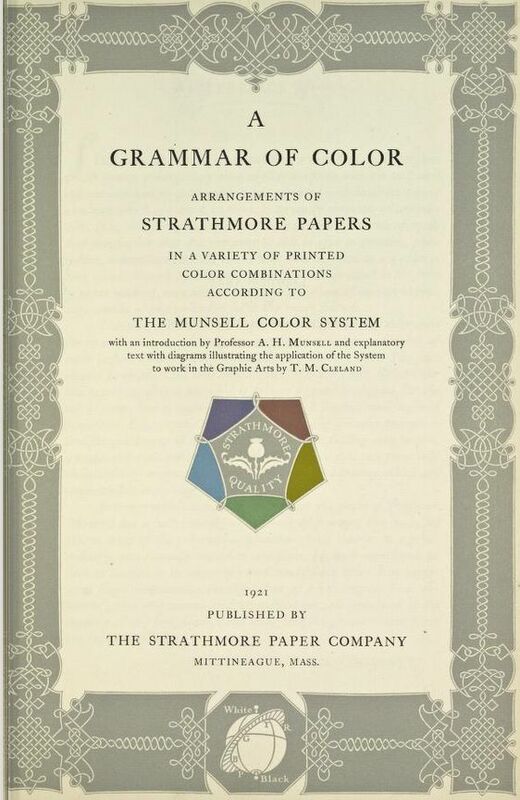 After suggestions for how the book should be used and how the book was printed, the rest of the book consists of fold-outs of various colored Strathmore cover papers printed with measured color areas arranged according to the Munsell Color System. So stay tuned to the Munsell Color Blog for new installments of chapters from the book, or check back to this post as we will link to the each chapter here as they are published. See the bottom of this page to subscribe to the Munsell Color Blog and receive updates in your email. Would love to receive info and updates. You can subscribe to our blog to stay up-to-date. Please add me to your blog. 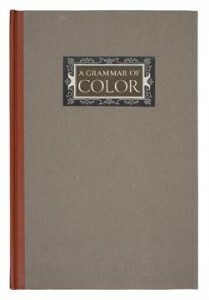 I would like updates on the book “A Grammar of Color”. I am a Professor of Studio Art at Eastern Connecticut State University (ECSU), where I teach Color Theory. I have read “A Grammar of Color” in the Library at ECSU. The book was donated to the Library by the late Paul Zelanski, Professor of Art at UConn, Storrs and contributor to the second edition of “The New Munsell Student Color Set, by Joy Turner Luke and Jim Long.